Experts in space missions, nanophysics, bioinspired materials and physics outreach have all been announced as winners. Imperial academics have scooped a total of four medals in all three categories of the Institute of Physics (IOP) annual awards. The IOP has announced Gold Medals for outstanding and sustained contributions, its Silver Subject Medals for distinguished contributions to physics and its Bronze Early Career Medals that recognise and reward exceptional early career contributions. Professor Dougherty was Principal Investigator for the key magnetic field instrument aboard the international NASA-ESA Cassini-Huygens spacecraft orbiting Saturn. 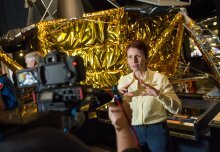 She has also has led the international study of the Europa Jupiter System Mission (EJSM) and the European-only mission study of JUICE (JUpiter ICy moon Explorer), due for launch in 2022. The magnetic field instrument on Cassini was also centre-stage in the mission’s ‘Grand Finale’, a sequence of very close fly-bys culminating in a plunge into the planet. The carefully processed data promises to unravel the enigma of Saturn's planetary magnetic field. Professor Sutton, from the Department of Physics, applies fundamental physics to understand and predict the structure and properties of materials of technological significance. He is one of the four fellows of the Royal Society who founded the Thomas Young Centre for the theory and simulation of materials, which is made up of around one hundred research groups from Imperial, King's College London, Queen Mary University London and University College London. In 2009 he also became the founding director of the Centre for Doctoral Training on Theory and Simulation of Materials. Her diverse research group includes regenerative medicine studies, looking at stem cells, bioactive scaffolds and tissue regeneration. For example her group develops novel approaches to tissue engineering that could produce large quantities of human mature bone for transplantation, as well as other vital organs such as liver and pancreas. In the field of nanotechnology, her group currently researches biomolecular recognition and self-assembly mechanisms to create new dynamic nanomaterials, biosensors and drug delivery systems. Dr Wade completed her masters and doctorate at Imperial, and now works as a postdoc researcher studying organic light emitting diodes. Alongside this, she is a fierce promoter of physics, particularly to girls, through events and outreach activities at Imperial. Among her many outreach activities, she has represented the UK on the US State Department International Visitor Leadership Programme ‘Hidden No More’, and worked with teachers across the country through the 'Stimulating Physics Network'. On her award, Dr Wade said: “This isn’t really a prize for me, but a prize for Imperial - I’ve grown up at Imperial, fallen in love with physics at Imperial and realised the importance of sharing my enthusiasm with others at Imperial.